literASIAN: A Festival of Pacific Rim Asian Canadian Writing represents a turning point in the Asian Canadian literary world, a maturation of over eighteen years of hard work. In 1996, an inexperienced ragtag group of writers of Asian descent formed a non-profit society to help fledgling writers who would otherwise be neglected by mainstream publishers to have their voices heard and their words written. The Asian Canadian Writers’ Workshop Society (ACWW) was thus born. The mission was simple but noble: establish a support network to promote these writers with an inclusive and sensitive environment to produce writing that was personal and representative of their identity. What was initially an activist project matured eighteen years later into a social and cultural fabric of the Canadian literary canon. Festival Director Jim Wong-Chu with opening remarks to literASIAN 2013. UBC Learning Exchange Director Kathleen Leahy welcomes audience. This entry was posted in Asian Canadian Cultural Events, Literaray Events, Literary Events, Multicultural events, Upcoming Events and tagged Asian Canadian Writers' Workshop, literASIAN on November 23, 2013 by allancho. This entry was posted in Asian Canadian Cultural Events, Multicultural events, Uncategorized and tagged Asian Canadian Writers' Workshop, literASIAN on October 14, 2013 by allancho. Additional workshops are $10 each. As writers, we want to be published. But publications cost money and publishers therefore look for manuscripts that fall into their mandate. They cannot publish everyone. They are honest about it and will reject without feeling guilty. To emerging and some mid-list writers the publishing process can be quite a mystery. Writers can be manipulated and exploited by unscrupulous “publishers”. The following questions must be asked. What are the positives and negatives of being published? Why publish in the first place? What is needed to approach a publisher? Are multiple submissions allowed? What are the pitfalls along the way? Is the Vanity Press the way to go? What are the scams? What are the advantages and disadvantages to on-line publishing? What good is an agent? Can the Writers Union and other associations help? What other resources are available? These and other questions will be looked at in this workshop sharing experiences with the process of getting publishing. Instructor: Terry Watada’s publications include Kuroshio: The Blood of Foxes, (novel, Arsenal Pulp Press 2007), three books of poetry, Daruma Days (short fiction, Ronsdale Press 1997), and Bukkyo Tozen: a History of Buddhism in Canada (non-fiction, HpF Press & the Toronto Buddhist Church 1996). His essays have appeared in Maclean’s Magazine (March 2011) and Canadian Literature (UBC) to name two. He maintains a monthly column in the JCCA Bulletin, a national magazine out of Vancouver. He was presented the Queen’s Diamond Jubilee Medal in 2013. His archives of books, records, manuscripts, and significant artifacts have been collected as the Terry Watada Special Collection and housed in the East Asian Library, Robarts Library, University of Toronto. David was recently inducted as an Honorary Witness for The Truth and Reconciliation Commission of Canada (TRC). The TRC hopes to guide and inspire First Nations peoples and Canadians in a process of truth and healing leading toward reconciliation and renewed relationships based on mutual understanding and respect. As an honorary witness, David will initiate a new graphic novel to help document stories from this dark period of our nation’s history. Attendees to this first workshop will be invited to participate and to embrace an upcoming year(s) of social isolation, missed family celebrations, late night research, and low pay in an effort to help push out this meaningful graphic novel. Denise will discuss the nature of memory and interviewing techniques on the part of the writer and as well, the research that helps to bring characters and scenes to life. Instructor: Denise Chong is an award-winning and internationally published author. The Girl in the Picture was a finalist for the Governor General’s Literary Award, as was her memoir, The Concubine’s Children. She lives in Ottawa with her husband and two children. Instructor: May Yan-Mountain has been involved in many activities related to Chinese family history. The anthology “Eating Stories: A Chinese Canadian Aboriginal Potluck” was her co-writing debut with other writers each sharing family stories and traditions. Following her participation as the Chinese genealogy consultant for the segment “Chinese Connection” in “Ancestors in the Attic”, a Canadian genealogy series shown on History Television in Canada, May held a series of Chinese genealogy workshops at the Vancouver Public Library. In combination with her publications “Research Guide to Chinese Genealogy” 1st and 2nd edition, May taught the local Chinese genealogy researchers a variety of tools to discover documents and records found in libraries, genealogy databases and other hidden sources. May is currently residing in the Lower Mainland of British Columbia, Canada. She received her Bachelor of Arts in Asian Studies with a focus in Chinese history and language from the University of British Columbia. When you write a story or a suite of poems, they shouldn’t end up in your drawer. In this age of digital media, a literary work could also become an article, a blog piece, a Huffington Post blog, an iPad app. This gets your work read more widely, but even more interestingly, it allows your work to morph into new forms. In essence you can begin to think of each work as a kind of ‘brand’ that could be proliferated across media. Participants in this workshop will look at case studies including Ann Shin’s poetry book/video/interactive e-book The Family China. Other projects referenced include Jennifer Egan’s A Visit from the Goon Squad and Sarah Sheard’s latest blog/nonfiction memoir project. Participants will discuss current literary projects of workshop attendees and brainstorm together on how they could take their work into different media. Ann Shin will also provide practical information about various funding avenues for certain kinds of digital media projects and how to partner with industry, eg. established interactive media agencies. Instructor: Ann Shin is a writer and filmmaker who grew up in Langley, BC and now lives in Toronto. 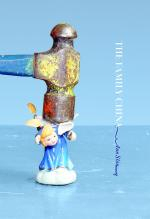 Her latest book of poetry, The Family China was published by Brick Books this year. Winner of the 2013 Anne Green Award, the book is also related to a video series and an interactive e-book project. Her latest documentary The Defector: Escape from North Korea was nominated for 4 awards, winning an FITC Award in Motion Graphics. Discussion on writing through five levels – vocation, trade, craft, passion, calling – framed with the authors own experience writing and publishing Banana Boys. Examples of how race, culture, school, relationships, politics, activism, money affects the process of writing will be amply provided. If you’re looking on a quick “how-to” workshop on publishing a book and making a lot of money, this isn’t it; rather, I’d like to have a frank talk and open discussion on how writing is ultimately a process traversing all five levels, with varying degrees of functionality, dysfunctionality, and satisfaction… if there is such a thing. Instructor: An engineer turned fiction writer, Terry Woo has received acclaim for his first novel Banana Boys, which was short-listed for the 1999 Asian-Canadian Writer’s Workshop Award, and published by The Riverbank Press – an imprint of Cormorant Books – in 2000. He also went back to school for Journalism, joined the Army for a hitch, and has ended up doing corporate writing for a software company which he says “is not as good a writing haikus, but somewhat better than writing obituaries.” Terry currently resides in Toronto. In November 2012 Janie Chang’s debut novel was acquired by HarperCollins Canada in a pre-emptive offer. In August 2013Three Souls went on sale in bookstores all over Canada — including Costco. When all the pieces fall into place, is it due to luck and timing or does an understanding of the publishing business play a role? Janie talks about the decisions, both deliberate and serendipitous, that contributed to the success of Three Souls. In particular, she discusses the business realities of getting published in today’s turbulent mainstream market. Instructor: Janie Chang draws upon family history for her writing. She grew up listening to stories about ancestors who encountered dragons, ghosts and immortals, and about family life in a small Chinese town in the years before the Second World War. She is a graduate of The Writer’s Studio at Simon Fraser University. Born in Taiwan, Janie has lived in the Philippines, Iran, Thailand, and New Zealand. She now lives in Vancouver with her husband and Mischa, a rescue cat who thinks the staff could be doing a better job. Three Souls is her first novel. Have you ever read a story that had absolutely no emotional impact and thought what a pity the writer hadn’t been able to find the emotional core of the story? Powerful writing often elicits strong emotions in readers. Stories without an emotional core usually fall flat. But how does a writer find the emotional core of a story when staring at a blank page? This workshop examines the elements of emotional storytelling and introduces some techniques to help create stories with emotional weight. Please come with writing implements or laptops. This is a hands-on workshop. With luck, you may be able to walk away with the beginnings of a short story or even the climatic scene of a novel. Instructor: Julia Lin, author of the short story collection Miah (TSAR Publications, 2012), was born in Taiwan and lived there and in Vietnam before her family immigrated to Canada when she was nine. Since then, Julia has lived in Vancouver and its environs, Toronto, and northern British Columbia. She holds a graduate degree in Immunology (M.Sc., University of Toronto) and a post-graduate degree in computing education (University of British Columbia) and has taught high school math, science, and computing science in British Columbia for a number of years. Her writing mentor, M.G. Vassanji, encouraged her to complete Miah after she submitted the first stories in the 2009 Humber Creative Writing Program. For more information, please go to www.julialinbooks.com. This entry was posted in Asian Canadian Cultural Events, Multicultural events and tagged Asian Canadian Writers' Workshop, literASIAN on October 14, 2013 by allancho. Dim Sum Stories, evokes the Chinese-style of cuisine featuring many delectable dishes of dumplings and bite-sized morsels often socially tasted in Chinese restaurants in the mornings and late afternoons. The Asian Canadian Writers’ Workshop is producing the inaugural literASIAN: a Festival of Pacific Rim Asian Canadian Writing which will have Larry Wong as one of the featured authors at the opening reception on November 21 and closing dinner gala on November 24. Larry will be giving a reading and author signing of Dim Sum Stories. Dim Sum Stories: A Chinatown Childhood is Larry Wong’s memoirs, a nostalgic glimpse back at growing up in Vancouver’s Chinatown during the 1940s and ’50s, and paints the portrait of his family. Larry’s father is a central part of Dim Sum Stories, where his journey began from a Chinese village to settling in Canada. The senior Wong’s story is much like those of other Chinese who immigrated to British Columbia during and following the gold rush. After setting up a shirt-tailoring store, he was able to save and borrow enough to bring his wife and children over. This story of struggle and survival also inspired Larry’s most recent play Empress of Asia, performed at the Firehall Arts Centre. This entry was posted in Asian Canadian Cultural Events, Chinese Canadian Historical Society of BC events, Chinese events, Multicultural events and tagged Asian Canadian Writers' Workshop, Chinatown, Chinese Canadian, Dim Sum Stories, Larry Wong, literASIAN on September 26, 2013 by allancho. David HT Wong’s Escape to Gold Mountain is just one of many great new graphic novels to come from Asian Canadian authors. Terry Watada will be launching the first Japanese Canadian graphic novel at literASIAN 2013 in November, organized by the Asian Canadian Writers’ Workshop (ACWW). How do we deliver Nikkei historical information in an engaging and creative manner? One vehicle might be the Japanese manga genre – although it must be noted that not all youth are drawn to it. Nikkei Manga-gatari traces and ties together three generations of Nikkei history and culture in an engaging visual format. The inspiration for this project was the immensely popular 1983 manga titled Oishinbo that dealt with Japanese food and cooking. Written by Tetsu Kariya and drawn by manga artist, Akira Hanasaki, it has sold over 100 million copies worldwide. On the surface, the manga is about the exploits of newspaper writers trying to track down the ‘ultimate menu’ that reflects the best in Japanese cuisine. Each volume focuses on an essential ingredient and gives the reader detailed social, cultural and historical information. Based out of Toronto, Terry was able to put the manga stories together in a relatively short period of time. The bigger challenge was finding a Japanese Canadian artist willing to take on the task – ideally a yonsei artist who would use this opportunity to learn more about our community’s legacy. On Friday November 22, 3.00-5.00PM at UBC Learning Exchange, Terry Watada will be giving a workshop called Writers Beware: how to avoid scams, vanity press and find happiness as a published author. Terry is one of the pioneers of Asian Canadian writing, with publications that include Kuroshio: The Blood of Foxes, and three books of poetry, Daruma Days; and Bukkyo Tozen: a History of Buddhism in Canada (non-fiction). He maintains a monthly column in the JCCA Bulletin. His archives of books, records, manuscripts, and significant artifacts have been collected as the Terry Watada Special Collection and housed in the East Asian Library, Robarts Library, University of Toronto. Most recently, he was presented the Queen’s Diamond Jubilee Medal in 2013. This entry was posted in Asian Canadian Cultural Events, Multicultural events and tagged Asian Canadian Writers' Workshop, literASIAN, Terry Watada on September 25, 2013 by allancho. It’s hard to believe, but we’re only a couple of months away from the long-awaited return of Terry Woo to the Asian Canadian literary stage. The author of of Banana Boys will be the featured author and workshop instructor at literASIAN: a Festival of Pacific Rim Asian Canadian Writing. Banana Boys is a novel about five Chinese Canadians, “Bananas” (read: yellow on the outside, white on the inside), caught in between two cultures which do not seem to accept them fully. Not quite Chinese and not really Canadian, they stumble through stories, situations, incidents, interactions that are seemingly mundane, but upon closer examination, ultimately explore the nature of identity, and reveal the possibilities within themselves. Alienated, frustrated and neurally-overactive, the story takes them through a complicated and sometimes bewildering sea of relationships, traditions, values, technological revolution, pop-culture and social change. They struggle with the trials and tribulations that modern Canadian society poses to all marginals, generally finding ignorance and misunderstanding from virtually every source except each other. Terry will be offering a once in a lifetime workshop, How to Succeed in Writing by Kinda-Sorta Trying on Saturday November 23, 1.00-3.00PM. Mark you calendars. This entry was posted in Asian Canadian Cultural Events, Literaray Events, Literary Events, Multicultural events and tagged Asian Canadian Writers' Workshop, literASIAN, Pacific Rim, Terry Woo on September 21, 2013 by allancho. Long time Asian Canadian Writers’ Workshop (ACWW) member and supporter Denise Chong will be launching her latest book Lives of the Family at literASIAN 2013. As the international bestselling author of The Concubine’s Children, Denise Chong returns to the subject of her most beloved book, the lives and times of Canada’s early Chinese families. In 2011, Denise Chong set out to collect the history of the earliest Chinese settlers in and around Ottawa, who made their homes far from any major Chinatown. Many would open cafes, establishments that once dotted the landscape across the country and were a monument to small-town Canada. This generation of Chinese immigrants lived at the intersection of the Exclusion Act in Canada, which divided families between here and China, and 2 momentous upheavals in China: the Japanese invasion and war-time occupation; and the victory of the Communists, which ultimately led these settlers to sever ties with China. This book of overlapping stories explores the trajectory of a universal immigrant experience, one of looking in the rear view mirror while at the same time, travelling toward an uncertain future. Intimate, haunting and powerful, Lives of the Family reveals the immigrant’s tenacity in adapting to a new world. This entry was posted in Asian Canadian Cultural Events, Chinese Canadian History and tagged Asian Canadian Writers Festival, Asian Canadian Writers' Workshop, Denise Chong on September 18, 2013 by allancho. Have you heard yet? The Asian Canadian Writers’ Workshop will be hosting Ann Shin’s book launch of The Family China as part of literASIAN 2013, Nov 21-24. The Family China is a book of poems about the sense of belonging, about the tenuous ties we make across borders both international and internal. The Family China, Ann Shin’s second book of poems, examines the decentering experiences of migration, loss and death, and the impulse to build anew. In five suites threaded through with footnote-like fragments that haunt and ambush the text like memories, the book accrues associations, building and transforming images from poem to poem, creating a layered and cohesive collection that asks daring questions about how we define ourselves. These poems grapple rawly and musically with the profound messiness of human relations; their candour consoles and instructs. The quandaries in The Family China are deeply recognizable. Strung up between fragility and resilience, between naïve hope and domestic disillusionment, between an untenable nostalgia for the pastoral and a deep unease with the global, the voice of these poems is nevertheless determined to find some scrap of a song we can sing in common. This entry was posted in Asian Canadian Cultural Events, Multicultural events and tagged ACWW, Asian Canadian, Asian Canadian Writers' Workshop on September 17, 2013 by allancho.